The American Revolution Book I read is called My Brother Sam Is Dead by James Collier and Christopher Collier. This book is talking about Tim’s life turns upside down when his older brother, Sam, defies their father and goes off to fight in the Revolutionary War and then his father disappears. During, the cyclone of war, Tim helps his mother run the family tavern. This book is full of excitement and hard truths. If people are loyal, they will have friends and other people who trust them. Because Sam would do anything for the Patriots and is risking his life for his nation. Also, Tim shows loyalty to his father when he takes the Brown Bess from Sam and threatens to shoot at Sam. I am a boy, a colonist and a shy person. You can call me Charles. Our house is in Boston. We don’t like the British. I am involved in the fight with the British, I have a conflict between I don’t want to kill people; I’m scared to get killed and wants independence of my country. I become braver. Still doesn’t like British. Read my journal to figure out are we success. After the American Revolution, many things have changed. American now is an independent country. Have a president instead of a Monarchy. And had religious freedom. After the American Revolution, many things have stayed the same. American still have different states and women didn’t have as many rights as men until 1920 women couldn’t vote until 1960-70 women didn’t have guaranteed personal rights. Fight for Independence & Freedom !!! The American Revolution was a fight for independence from the colonist against the British. The revolution started when America was a colony of British. The colonists were under British control. The British treated colonists poorly and the colonists did not have freedom. After many years, colonists started to fight for freedom against the British. During this fight, France’s force came and helped colonists fight against the British. Two years later, the colonists were finally free and became an independent country. 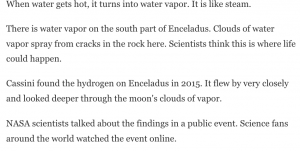 Claim: NASA future missions should be focus on Enceladus, one of the moons of planet Saturn. Reasoning: NASA future mission should be focussing on Enceladus because this solar system had discovered water(hydrogen) in it. Basically, can say that everything can not survive without water so is have the possibility to find life in Enceladus. If they really have it. It can help the earth and improving our life.